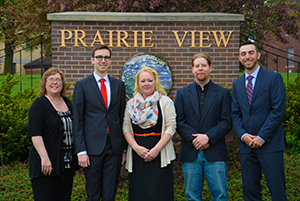 Laura Huinker, assistant professor of business at UIU; Charles Alcaide '15; Sylvia Mork, chief executive officer/administrator at Prairie View Management, Inc.; Nick Reierson '13, Priaire View office assistant; and Jake Baroon '15, pose for a photo at the main gate of Prairie View. When Jake Barron ’15 graduated from Upper Iowa University, he not only left with degrees in business and communications, but also a management training position at Toyota and the beginning of a dream to turn his “consulting club” senior project into a future career. Barron, then a senior from Torrance, Calif., and his fellow students formed the consulting group to work with Prairie View Management Inc., an organization devoted to serving individuals will mental illness, intellectual disabilities, and co-occurring disorders who require assistance with daily living activities. Prairie View has facilities in Fayette and Chickasaw counties. Sylvia Mork, Prairie View CEO/administrator, said she contacted UIU regarding development of a new logo for the organization after successful projects with UIU art students and UIU information technology students. Barron’s team also worked with UIU alumnus Nick Reierson ’13, a business administration major from Clermont, Iowa, to put the plan into action at Prairie View. Reierson, who has been employed in Prairie View’s business office since July 2014, now has newly designed marketing materials and a new website at his disposal. Team leader Barron, who picked up the project about halfway through its development, credits his team and faculty advisors for success of the project. Members of the team included Charles Alcaide ’15, a graphic arts major from France; Rachel Curtis, a freshman from Manchester, Iowa, majoring in graphic design and management; Sarah Gonner ‘14, a business administration and financial management major from Manchester, Iowa; Yoon Yeep Low ’15, a business administration major from Malaysia, and Kayla Rickerl, a senior from Riceville, Iowa, majoring in health services administration and marketing. Meanwhile, team member Justin Tangen ’14, a business administration and marketing major from Sioux City, Iowa, is working toward a MBA, with an emphasis in human resources management. Lecturer Laura Huinker from the School of Business was the faculty advisor. Barron has also begun planning for what he hopes is his future business model. “Elevate” would be a higher education consulting firm that would recruit colleges/universities as clients and recruit their business students to do the actual work as a form of internship. To see the consulting club’s work, go to: http://www.prairieviewiowa.org/home.html.